Over the last several years, Huston-Tillotson University (HT) in Austin, TX has been steadily improving its environmental profile. Highlights include the introduction of an Environmental Studies major, a 240 kW rooftop solar installation, environmental education and outreach via the Dumpster Project, the activities of sustainability student group Green is the New Black, and attendance at the United Nations COP21 climate conference in Paris. This progress is just part of what we hope is a broad campus transformation. Building a green identity requires clear self-reflection; we continually ask “what does it really mean for a university to be green?” For a historically black institution like HT, a large part of the answer lies in the intersection between the school’s history and the practice of environmental justice. Environmental justice (EJ) is increasingly prominent in environmental circles. EJ is based on the understanding that all of us deserve a healthy environment – clean air and water, healthy food, and biodiverse ecosystems free of toxic agents. The goal of EJ, then, is to ensure that environmental benefits and burdens are equitably distributed. EJ emerged as a community-based movement in the 1980s, bolstered by groundbreaking studies that detailed how environmental burdens in the US disproportionally affect marginalized communities. Economic pressures, inadequate representation, and corporate abuse contribute to a pervasive pattern: poorer people and people of color were found to live near polluting industries, landfills, and areas with poorer air quality. Much EJ work focuses on correcting this pattern by raising awareness, renewing impacted areas, and creating community resilience. Restorative initiatives like Sustainable South Bronx and Little Village Environmental Justice Organization go beyond mitigating environmental abuses to address the system that allowed these situations to perpetuate. Thus, EJ often addresses racism, gender discrimination, worker’s rights, economic inequalities, access to healthcare, inclusive governance, and community development. Environmental justice is built on social justice. And social justice is a road historically black colleges have walked before. There are 107 Historically Black College or Universities (HBCUs) in the US. HBCU is a special designation for private and public institutions of higher education founded before 1964 with the mission of educating black Americans. Most HBCUs are located in former slaveholding states, and most were formed before 1900 – many during the Reconstruction period with the assistance of organizations like the Freedmen’s Bureau and the American Missionary Society, or in 1890 when federal funding for black land-grant colleges was enacted. Most HBCUS began as teacher training colleges (normal institutions), seminaries, or agricultural and technical schools. They have evolved. Today, HBCUs range in size from large research-focused universities to community colleges. Despite this heterogeneity, HBCU’s common founding mission – and commitment to address inequalities – ties them together. HBCUs have lent powerful voices to social justice movements from civil rights to women’s rights to worker’s rights. They are suited by history and by vision to bring their impact to environmental rights. HBCUS are particularly well-positioned to tackle the “green ceiling” problem, that is, environmental organization leadership demographics that do not reflect the diversity of our communities. Huston-Tillotson first took steps towards improving its environmental profile in 2008. Campus recycling was instituted and HT joined what was at the time the American College & University Presidents’ Climate Commitment (ACUPCC), a signature program of Second Nature now known as The Carbon Commitment. Since then, students, staff, and faculty have implemented environmental projects in academics, campus engagement, community outreach, and operations. Some of these projects have broken new ground for our institution. For example, based on AASHE’s database of university solar installations, HT now has the largest rooftop solar installation of any private HBCU. As HT’s green identity has developed, our institutional focus on environmental justice has sharpened. HT has hosted the Building Green Justice Forum, a day-long environmental justice conference, for the last two years. Environmental efforts on campus were united in a newly formed Center for Sustainability and Environmental Justice. And students in Green is the New Black, whose mission is to promote sustainability through campus engagement and community outreach, have linked HT to the broader HBCU-EJ community through their participation in the HBCU Student Climate Initiate, a project led by environmental justice powerhouses Dr. Beverly Wright and Dr. Robert Bullard. 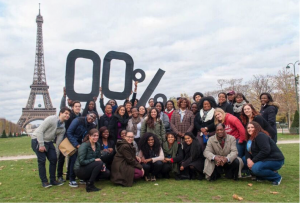 The commitment of HBCUs to voicing EJ concerns reached the global stage just a few weeks ago, when a delegation of 50 HBCU student leaders and mentors attended the UN COP21 climate conference. HT Green is the New Black students Brittany Foley and Elvia Hernandez and mentors Dominique Bowman and Karen Magid joined representatives from 15 other HBCUS to deliver their call for climate justice. Environmental justice adds a critical perspective to environmentalism that demands the attention of our campus efforts. Attention to EJ can also compel students who may not normally be interested in environmental efforts. We hope that HT and other HBCUs can serve as examples of how to blend social justice and environmentalism. Photos courtesy of Huston-Tillotson University. Featured image: Green is the New Black students with Austin Mayor Steve Adler, HT President Collette Pierce-Burnette, and HT Sustainability Director Karen Magid at the solar installation opening ceremony.